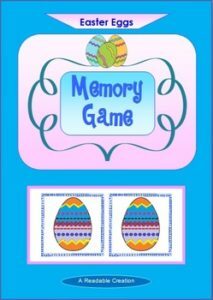 This Easter egg picture pair matching activity (15 pairs) will provide fun while reinforcing your students’ visual memory skills. The Memory Card Game is played as the game, ‘Concentration’. You’re welcome to check out the other Easter resources by Readable Creations.